It’s all about fun, focus and practice. For all of us. There’s no magic trick and it’s not about talent. It’s about time to focus and practice. So what did you do with your first month of January? I had loads of work, so I didn’t take the time enough I was writing about on the 31st of December in my previous post. I spend a lot of time working for the office and not enough time having fun, but I managed to save time anyway by going less on Facebook. By deleting the app from my smartphone I saved at least an hour or two a day, because now I only open Facebook from time to time when I’m on my computer, and not on my phone during any spare time I have. So I read more books and I draw more, and spend less time consuming my phone altogether. “Take care of your thoughts, because they will become words. The sources I found are very diverse: Talmud, Dalai Lama or Chinese proverb….? I don’t know which one is correct or which one was first, but I can also say they apply to us all. We are all human beings. Or to say it more clearly: Man or woman, black, white or yellow, rich or poor: when we go to toilet we all smell and we’re having the same sh*t. All together. Just one human race. We all have just one life and one planet earth, so let’s make the best of it? More love and less hate. What else happened this month? I started a new Sketchbookskool class with Veronica Lawlor (www.sketchbookskool.com) which stimulated me to draw more: almost a drawing a day. We experimented with different lines, thin and thick, different patterns and textures, different colors, shapes… I also started giving watercolor workshops. These are also a lot of fun. Teaching others is always a personal challenge, as it forces me to think about what and why I do something, and how. And also because we teach what we most need to learn. Now at least I make time every day to make a drawing. When I don’t have a lot of time I at least make a tiny thumbnail drawing in my sketchbook, like just a door handle. And like Veronica Lawlor said on the end of the course : there are no magic tips, techniques or shortcuts to drawing. It’s all about focus and practice, about doing it every day to train your drawing muscles and getting more confident as you go. The truth is you already know how to draw: we all did is as a child. You just have to find it back and unlock it, let it come out. It’s like handwriting: by doing it more and more you’ll discover your own style. It’ll also become a special moment of meditation and relaxation. Drawing, painting, writing: it’s all about focus and practice. 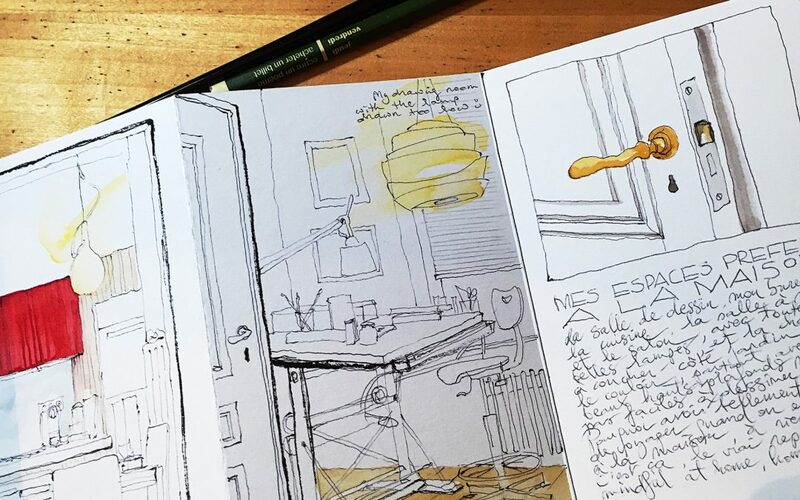 I lacked some inspiration lately to go drawing outside, and besides it’s freezing cold in Brussels, so I started a sketchbook about “home”, with all sketches about what I like most at home. Very relaxing. I’ll even start a second one for a friends home. I also force myself to mix some different drawing techniques: ballpoint, ink, pencil and watercolor. This gives some interesting contrasts. I show you in the video below. Which materials do you like most for drawing? I used to draw only with pencil, but found it puts too much perfectionist pressure on me to draw “correctly” and I spend too much time using the eraser. As I draw in ballpoint pen now and I can’t use the eraser, it feels liberating! (at something). Which makes it imperative that you connect and ask for help. At the same time that we encounter this humbling idea, we also need to acknowledge that you are better at something than anyone you meet. This is a very profound piece of writing, Barbara, and I am taking the liberty of copying these words and pinning them to the noticeboard alongside my computer. They deserve to be read MINDFULLY each day.